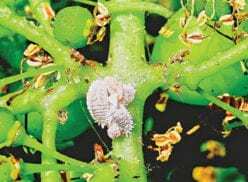 The aim of this study was to establish whether the yellow delta trap used for monitoring male mealybug numbers can also effectively be used to monitor mealybug parasitoids. Farmers use yellow delta traps (Figure 1a) to monitor male vine mealybugs (Planococcus ficus) and yellow sticky traps (Figure 1b) to monitor mealybug parasitoids numbers on their farms. 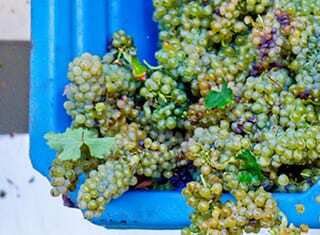 For the field study four vineyards (±3 ha each) with a history of parasitoid presence were selected as trial sites: Nietvoorbij (Stellenbosch), Groot Constantia (Cape Town), Backsberg (Paarl), and Morgenster (Somerset West). Yellow delta traps and yellow sticky traps were placed 30 m apart in the same row in the centre of each hectare. The yellow delta traps contained a removable white sticky pad with female mealybug pheromone lure. The traps were inspected fortnightly for the presence of parasitoids from September 2005 to August 2008. The parasitoids Coccidoxenoides perminutus and Leptomastix dactylopii appear to be equally attracted to yellow delta traps and yellow sticky traps as there was no significant difference between them in numbers captured (Figure 2). The parasitoid Anagyrus pseudococci, however, had a predilection for the yellow delta traps as trap catch numbers were significantly higher than on sticky traps (Figure 2). The predominant parasitoid species trapped was C. perminutus, which many growers use in augmentative releases against vine mealybug. FIGURE 2. Mean total number of parasitoids captured (all four farms combined), with different traps from September 2005 to August 2008. Means with the same letters are not significantly different at P = 0.05. 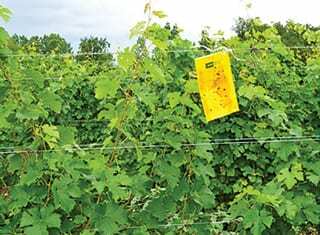 The yellow delta trap baited with female mealybug lure used to monitor the pest status of vine mealybug can also be used to monitor the presence of parasitoids in vineyards. 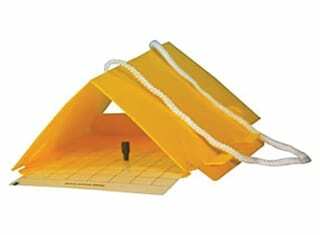 This avoids two sets of traps to work with, becomes more economical and reduces logistical problems, as only one set of traps will have to be sent to experts for counting and identification. 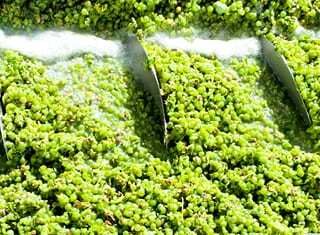 Field studies over three seasons showed that the yellow delta trap, currently used to monitor male mealybugs, could also be used to determine presence of both vine mealybug and parasitoids. 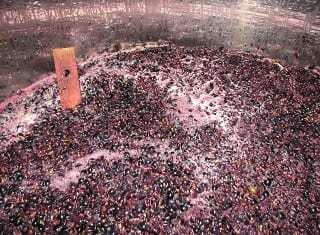 This article originates from research project number 230072, funded by Winetech and the Agricultural Research Council. The author wishes to thank L. Maart and L. Williams for assistance with the fieldwork. – For more information, contact Kwaku Achiano at achianok@arc.agric.za.